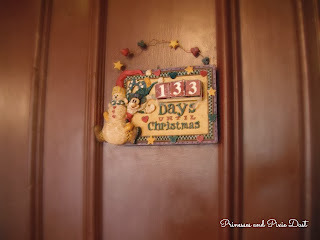 Princesses and Pixie Dust: Once Upon A Christmastime: Celebrating the Season with Mickey Mouse! Once Upon A Christmastime: Celebrating the Season with Mickey Mouse! I love Christmas. Like, caroling 24/7, elf-level crafting, and can-recite-every-Rankin-Bass-television-special-from-memory love Christmas. The aromas of pine and peppermint, the warm fuzzies of family togetherness, and the magic of one sentimental season when people are able to put aside their differences to celebrate the spirit of giving- everything about it warms the cockles of my heart. And naturally, being that person who begins her annual cycle of yuletide cheer in mid-September, I absolutely adore any situation that lets me bask in unadulterated, unbridled expressions of Christmas cheer... like Mickey's Very Merry Christmas Party at the Magic Kingdom! For those of you who aren't familiar with the event (which I don't suspect is many of you), Mickey's Very Merry Christmas Party is a hard-ticket event in the Magic Kingdom of a similar structure to the Not-So-Scary celebration that runs in the months of September and October. During the party, guests are treated to special meet-and-greets with beloved (and often rare) characters, a festive fireworks display, and a parade that's filled to the brim with holiday cheer. As the spirit of the season kicked off this past weekend at the Magic Kingdom, I thought I'd share my five favorite things about Mickey's Very Merry Christmas Party! Okay, this clearly isn't from the Party... but I didn't have a blog to think about then! If you've never experienced Main Street, U.S.A. at Christmastime... man, you are missing out! Disney never (okay, rarely) does anything halfway, and that fact is unblinkingly apparent in the tinseled, trimmed, and totally decked halls (er- streets) of the quaint, little, turn-of-the-century spot. Wreaths and twinkling lights adorn shop windows, but nothing is so stop-in-your-tracks breathtaking as the tremendous Christmas tree smack dab in the middle of Town Square. Seriously, guys- if a tree can be "dressed to the nines", this one is it. From the first glimpse from the monorail (really, I wasn't joking about it being huge) to when it's an inch from your face, the only syllable able to escape your lips will be: "Whoa". As you make your way past the magnificence of that enormous evergreen, the experience becomes even richer with the strains of classic Christmas tunes drifting above the crowd... and it doesn't stop at Cinderella Castle! Each area of the park possesses its own festive loop, from a steel-drum-and-marimba rendition of "Mele Kalikimaka" in Adventureland to low-key arrangements of beloved carols in Liberty Square. No matter where you are in the Magic Kingdom, you're sure to be surrounded by nothing but Christmas cheer! 2) Did somebody say "free food"?! Okay, so the complimentary cookies and hot chocolate served at the Party may not be "free" in the technical sense (you are buying a separate ticket for all this, after all), but any time I don't have to shell out extra dough for Disney yummies is a fine day in my book! (That, of course, is not to say that I wouldn't invest in some sweet snackage in the parks... School Bread, why can't I quit you?) The cookies (of which you have the choice of either Chocolate Chip or Snickerdoodle) are the perfect complement to a steaming cup of cocoa that will warm your belly right up- not to mention that the dunk-ability factor is off the charts! I should probably mention that the hot chocolate cups are rather petite (and that their contents come from a packet... hey, I'm not picky! ), but both the cookies and cocoa are bottomless, so you can fill up to your tummy's content (read: go nuts, you crazy kid!). Multiple counter-service locations throughout the park hand out these goodies, and are indicated on the Party's guide maps... or by the droves of guests anxiously awaiting their sweet treats! Just a few highlights of my evening (with a special guest appearance from my cousin, Skye)! I'll come right out and say it: character experiences make Disney for me; if I see a princess, you had better bet that I will turn into an ecstatic four-year-old faster than you can say "Bibbidi-bobbidi-boo!". Luckily for me, Walt Disney World's hard-ticket parties offer character greeting experiences that are totally unique to any others that you'll find in the parks. From good ol' standby characters spruced up (usually in scarves- y'know, to endure those chilly Florida nights?) for the season to less frequently seen friends, opportunities abound for memorable and exciting experiences! 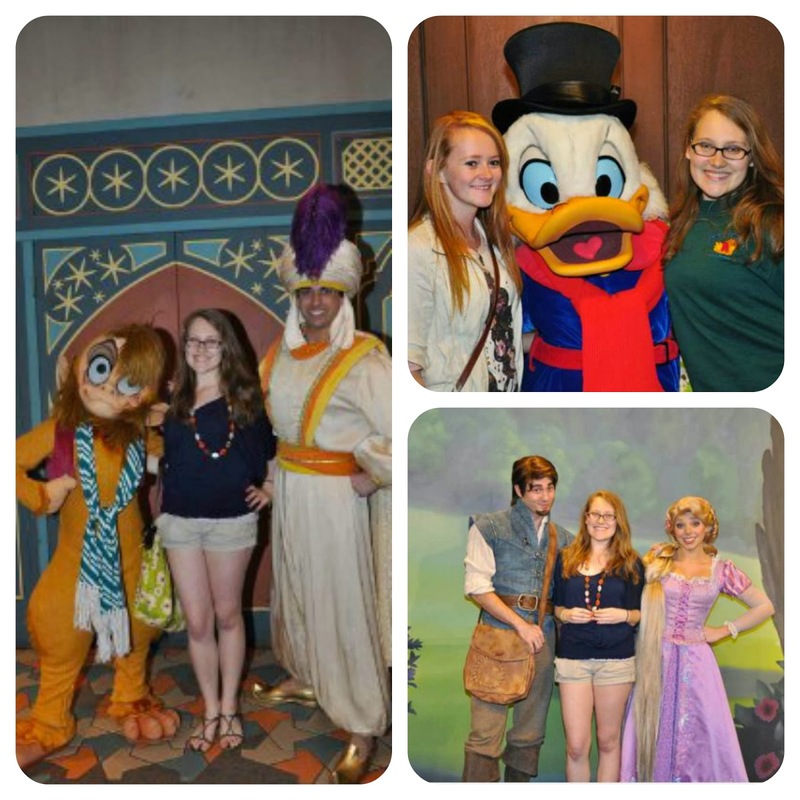 Simply getting to meet characters like Scrooge McDuck and Flynn Rider (check out that smolder!) are enough to make the purchase of a separate ticket worth the while, but it really is the quality of character interactions that put Mickey's Very Merry Christmas Party (and its Halloween counterpart) head-and-shoulders above the ones that take place on a day-to-day basis. With crowds lighter than they would be during regular park hours, characters are able to spend a little more one-on-one time with guests... and I'm sure you can imagine the kind of shenanigans that ensue! Also known as the show that needs no introduction. It's Disney, it's a fireworks show- how could it not be absolutely wonderful? On my visit, I watched the show from smack dab in the middle of Fantasyland, where I felt completely immersed in the magic. The program perfectly marries the magic of Disney to the incomparable spirit of Christmas that lives inside all of our hearts... not to mention the breathtaking view of Cinderella Castle draped with thousands of twinkling lights! We all know that Disney knows how to throw a parade... but this is a parade. Packed with more characters than you could ever ask for, a catchy soundtrack, and a special holiday guest (whose belly shakes like a bowl full of jelly... hint hint), the Once Upon a Christmastime parade is a totally immersive experience that surrounds you with the sights, sounds, and, yes, even smells of the holiday season! I don't know about you, but not much else compares to the sweet aroma of gingerbread wafting through the air as the spectacle of toy soldiers and larger-than-life reindeer marching down the avenues of Frontierland, Liberty Square, and Main Street, U.S.A. as they herald the arrival of jolly Saint Nick. If you aren't able to make it to the party, don't fret! Several sites have reported that, beginning December 21st, the parade will run during regular park hours. I certainly know I'll be making a trip out to see my very favorite Walt Disney World parade! 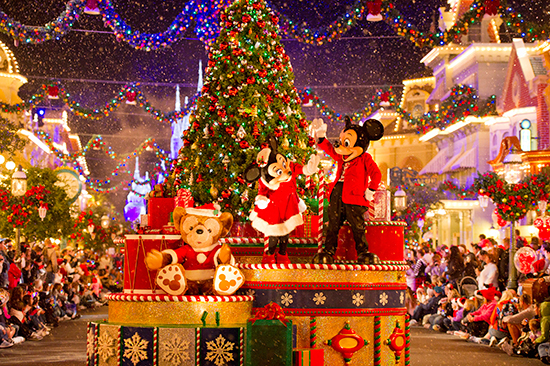 Have you ever been to Mickey's Very Merry Christmas Party? Last year's party remains- hands down- one of my most treasured Walt Disney World memories!